Classically trained fiber artists, Alice and Cristin, met at the Kansas City Art Institute and upon graduating began Owl+Mouse Textile Designs. Our focus is on creating fine and functional accessories for women, men, babies and the home. All of our products are hand designed, dyed, printed, and sewn. Our current line of organic cotton includes scarves, napkins, pillows, and baby items; and our line of organic linen and linen/cotton blend includes tunics, ties, bow ties, pocket squares and neckerchiefs. Our craftsmanship and unique dye process result in extraordinary colors and distinctive surface patterns setting our work apart from other textiles on the market. Our fabric is created with custom mixed colors and dyed in small batches using our own recipes. We begin with organic fabric that has to be washed, weighed and prepared for dyeing. Currently we use a variety of techniques including immersion, ice, shibori and dip dyeing. All of our solid colors are dyed in one pound batches. This process can take anywhere from 1-24 hours depending on the technique used. After dyeing the fabric, everything must be washed, dried, and ironed. To print our fabric, we first hand draw designs and transfer them to silk screens. 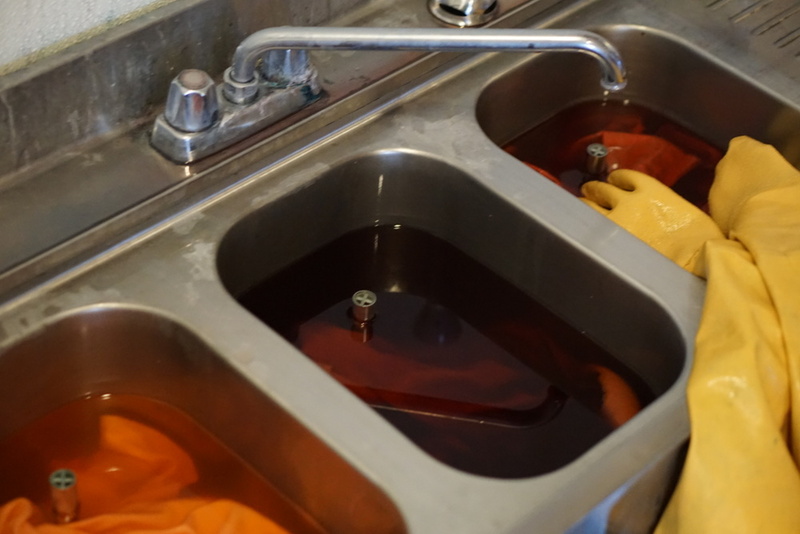 Once the screens and fabric are ready, we create thickened dye using custom color recipes. Printing with thickened dye allows the design to integrate into the fabric as opposed to ink that sits on top. the printed fabric must set for 24 hours, then we wash and iron each piece again. Our finished yardage is laid out with our patterns to determine the best placement of the design. Each piece is hand cut and prepped for sewing. We currently have two sergers and one sewing machine that are used for our finishing process. Everything is given a final press and then it is packaged and completed.